In an upcoming memoir covering his 12 years at the Elysee Palace, former French president Jacques Chirac has finally provided some juicy details about his relationship with successor Nicolas Sarkozy. For years people here have been yearning for anecdotes to substantiate widespread rumors about Chirac and Sarkozy’s shared animosity. But Chirac has always disappointed inquisitive journalists. The first volume of his best-selling memoir “Every step should be a goal”, which covered the ex-president’s life from birth to his ascension to France’s highest office, disappointed those cravings once more. But this week two French magazines, Le Nouvel Observateur and Le Point, have published excerpts from the book French politics junkies will soon be drooling over. Chirac finally cuts into Sarkozy. To start the former president says he feared long ago that Sarkozy would stoke tensions within his party and divide it even further. Chirac describes his successor as “nervous, brash, full of ambition, and full of himself”. 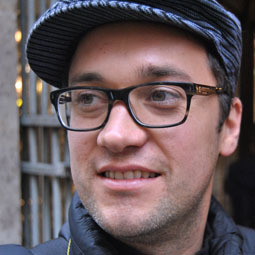 He explains in painful detail why on two occasions he dashed Sarkozy’s hopes of becoming prime minister. He counts Sarkozy out for the post in 1995, calling his loyalty into question. “There are too many zones of darkness and incomprehension between Sarkozy and me,” Chirac tells. In 2004, the possibility of Sarkozy’s appointment resurfaces, but Chirac says that arrangement would “inevitably” cause an “implosion” within his government. Chirac goes on to accuse Sarkozy of trying to provoke him publicly on several occasions, once by denigrating Japan and sumo wrestling, one of Chirac’s well-known passions. Not all words about Sarkozy are disparaging, however. Chirac thinks Sarkozy a capable minister of the interior, and even praises his work ethic, energy, and savvy media skills. Perhaps the episode that best illustrates their often bitter relationship comes after Sarkozy’s victory in the 2007 presidential election. Chirac had sought to bury the hatchet with Sarkozy, eventually endorsing his bid for the presidency. As Sarkozy delivers his victory speech, Chirac describes how he and his family listen carefully to each and every word, expecting a small measure of recognition. 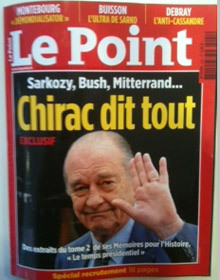 But Sarkozy does not mention Chirac once. “Deep down I am hurt, and know now what to expect,” Chirac concludes. Chirac hits back hard in his memoir, but I imagine it will not be the last word. Will Sarkozy have the last laugh when he writes his own memoir? En garde! He will be remembered for knifing the most ecomically successful tandem Giscard Barre, bringing Mitterand thus demolishing France Finances then posturizing on I raq but not preventing the US boys being deployed on the ground(right idea wrong gesture), supplyng submarines to Pakistan one of the most dangerous nations on the planet, and letting Papon of the hook the worst WWII French criminal, indeed a very dangerous and ambitious politician no wonder he scared Iran and Syria to pull out in Liban (his best achievment) with its standing and understanding of the terrorism problem.